All decorations were painstakingly hand-carved. It has embroidered flags, hand sewn sails, and accurate deck details and fittings. 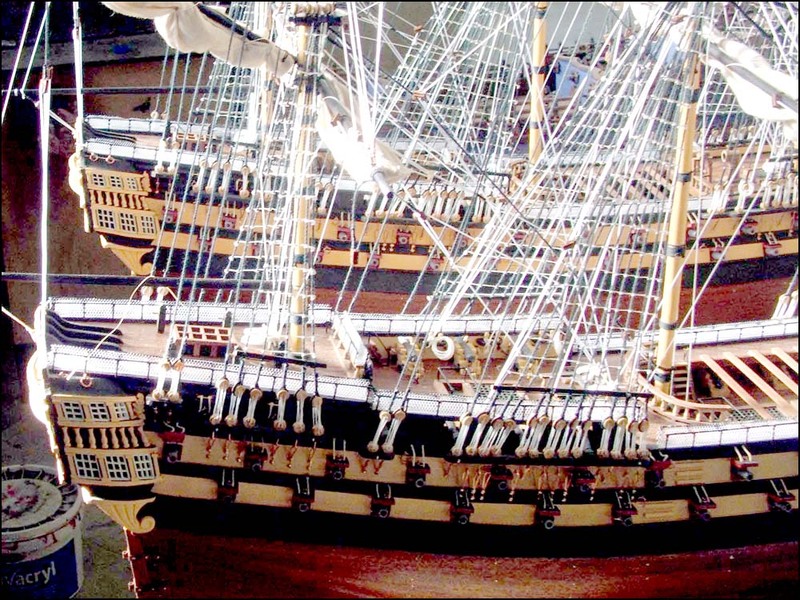 A large-scale very detailed wooden ship model built as a custom order according to client specifications. A clear demonstration of excellent craftsmanship: all decorations were painstakingly hand-carved. It has embroidered flags, handsewn sails, and accurate deck details and fittings. The Sovereign of the Seas was the most magnificent ship of her era. Designed in 1630's by Phineas Pett she was the first ship to have three full gun decks, carrying 102 guns on the orders of King Charles I. No expense was spared in her construction. Renamed the Royal Sovereign when Charles II came to the throne in 1660 she fought in several battles during the Second and Third Dutch Wars between 1666 and 1673. The Nine Years War against France broke out in 1689 and the Sovereign of the Seas (Royal Sovereign) was present at the Battles of Beachy Head in 1690 and Barfleur in 1692 when the Royal Navy fought alongside the Dutch. Her career came to an abrupt end when she accidentally caught fire at Chatham on 27 January 1696. Nowadays this historic ship model represents a true challenge to the ship model builder.